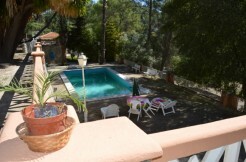 Villa in Xativa, 2 bedrooms, and pool. 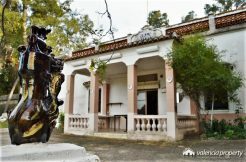 Simple and cozy villa in Xàtiva, located between pine forests with fabulous views, east of the Bixquert valley, 2 km from the city. A distance that can be traveled eventually on foot. Xàtiva, a city of 28,000 inhabitants, which historically was one of the most important towns in the Kingdom of Valencia and which rivaled even Valencia and Orihuela. Place of birth of the Borja Popes preserves an important artistic heritage. Currently a modern city with all kinds of services and dynamics in which there are activities at any time: congresses, music festivals, Fallas, Easter festivities, local festivities in August, exhibitions, fairs. It is also perfectly connected to the rest of the Spanish geography by train and road. The nearest airports are Manises in Valencia and Alicante. The plot (urban) is dominating, from the top of a hill, the views towards the natural place of the Black Cave and the river Albaida on its way through Alboi. The access is through a paved road with a fairly steep descent. In total the surface is 2155 m². The shape of the plot is rectangular and divided into two different levels. The lower level is really just a large parking area. From there, through a stone staircase you can access the second level where the house, the garden and the pool area. The house (Fully renovated in 2011) is small but the spaces have been used to the maximum, in such a way that it is very comfortable and cozy. It has 2 bedrooms, living room with open kitchen, and bathroom with shower with flat entrance. The usable area is 62 m². The materials chosen for the interior finishes, although simple, were chosen with taste, so there is no doubt that a large majority of potential buyers may like it. The beautiful outdoor porch is really a delight: spacious, high, with exposed wooden beams that give an authentic sense of rustic to the whole for being perfectly integrated with the rest of the environment, in nature. The view to the east, from the porch, is unique, a lush vegetation with pine forest on the horizon that only transmit tranquility and tranquility. However, if you also like sports, you have the facilities of a tennis club very close, where you can play racquet sports or socialize with the rest of the neighbors in the area. Equipped with air conditioning, wood stove, water and electricity. Outside, in a flat area surrounded by natural grass, is the pool of 8×4, with sewage treatment plant. There is a small warehouse between both levels and parking space. A perfect solution for those who want to live in a natural space all year round but do not need to borrow for life, with a tax burden and maintenance costs really affordable. If your budget is not high and you want to have the best at the best price, you have guessed right, this is your property. 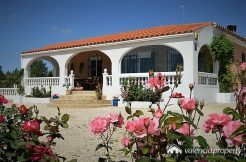 Fantastic villa with 2 bedrooms & pool, in Benisa (Alicante). Luxury villa in Chella, 100% private, 3 bedrooms, pool and garage.